(LOCATION: Destin FL) The Cruisers 330 Express is a full-featured cruiser with style, comfortable accommodations, and performance. The 330 is designed to be a step above cruisers in her class. She features a large open cockpit with ample seating and a mid-cabin interior with forward queen berth and convertible lounge. Planning a day on water or a weekend escape? This 33' Express has the room and features to accommodate. On deck we have a carpeted cockpit with radar arch and bimini top with camper canvas enclosure. The starboard helm features a Raymarine C80 color chart plotter, RD424 radar, Raystar 125 GPS, digital depth finder, and Ray 55 VHF radio. Seating includes a double-wide helm seat, companion lounge, a wraparound cockpit lounge, and a wet bar. A transom door gives access to the swim platform with transom shower. Forward we have a stainless steel bow rail, bow pulpit with roller, anchor and windlass, spotlight with remote control. The walkthrough windshield allows easy movement. The carpeted salon has port side galley with solid surface counter top, electric cook top, stainless steel sink, refrigerator/freezer, and built-in microwave oven. Opposite the galley is a convertible settee with dining table. The forward queen berth has under-berth storage, and two hanging locker. The mid-cabin has convertible seating area with privacy curtain. The head is off the salon and includes mirrored vanity with sink, electric head with holding tank, and shower. The reverse cycle HVAC unit maintains interior comfort and the 7.3-kW generator provides offshore electrical power. This big express is powered by twin Volvo 8.1 Gi engines with 375 horsepower. This family cruiser has been carefully maintained, and ready cruise. 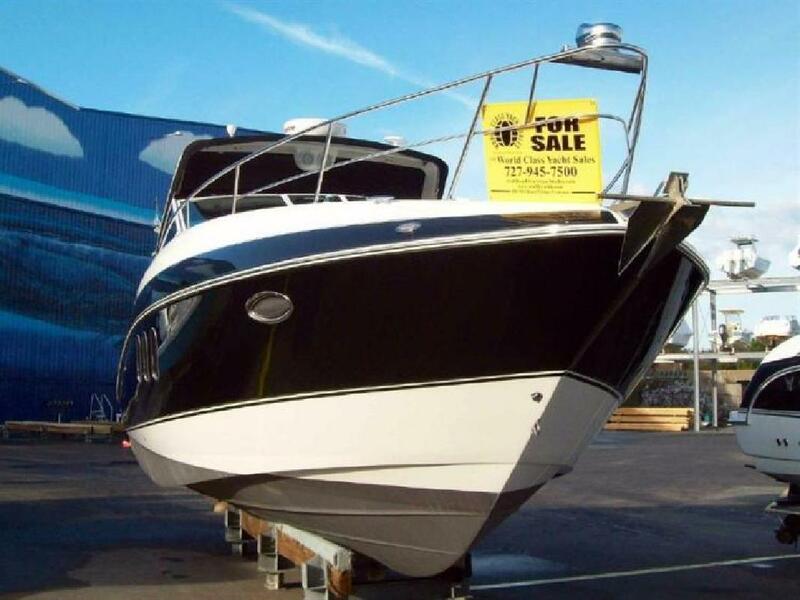 Call now for more information and to schedule a showing of this Cruisers Yachts 330 Express.